Bead sizes are typically referenced in millimeters. There are many reasons that you may need to know how many beads there are per inch or how many beads there are in a strand. For example, when you are purchasing the beads, you need to know you have enough for the project you are making. That is especially true for projects that require a specific number of beads, such as making a rosary necklace or a making a mala prayer bead necklace. A mala prayer necklace is typically made with 108 beads that are laid out in one of several configurations. If you want to make one, it is important to understand how many beads of each type you will need as well as how many beads come in each strand. Making a mala with 8mm beads can be frustrating because most bead strands have about fifty beads per strand. That means you will need one extra 16 inch strand just for 8 beads to finish the mala. Luckily, there are other mala configurations that can help you use smaller amounts of beads. Another situation where you might want to know the number of beads in a strand or inch is when you are planning on selling your jewelry. If you know how many bracelets or earrings you can make from a strand, then you can get a rough estimate on the cost of each item before you buy the beads. It's always a good idea to plan for how you might be able to use and ultimately sell the beads, if that is one of your goals. The last scenario when I have need the beads per inch information is when I am substituting beads from an original design. If the design calls for 8mm beads, but I only have 6mm beads in my stash, it's nice to be able to quickly calculate how many I will need. I'm sure there are other situations where you will find this information useful. 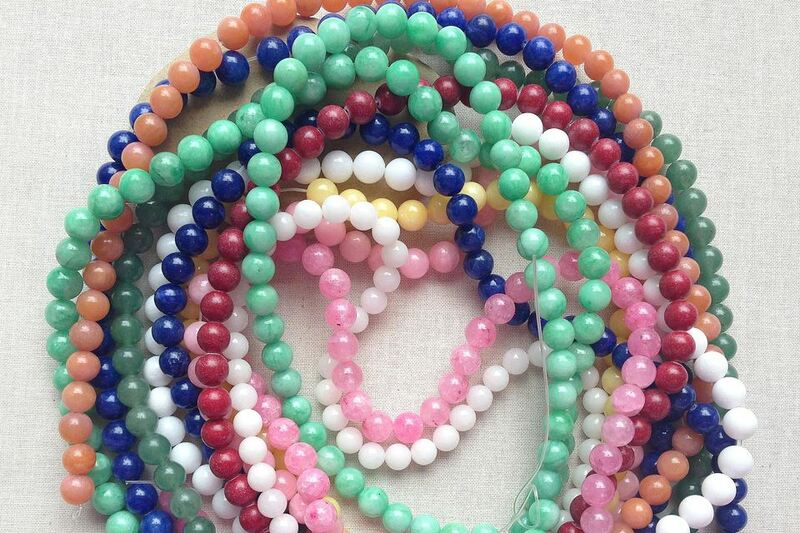 how many of a certain size bead are in 16 inches, the size of most standard glass and gemstone strands. Use this information to help plan out a bead stringing design, or calculate how many beads you'll receive when you purchase beads by the strand. To estimate how many beads make up a strand of a length that is not listed in the chart, multiply the beads-per-inch for the size bead by the length of the strand in inches. Here's an example. Question: How many 6mm beads are in a 16-inch strand?